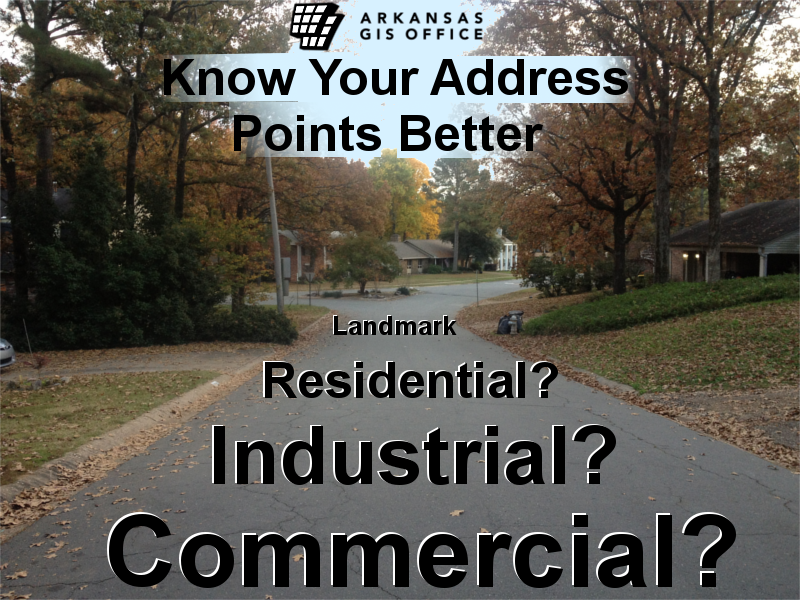 The Arkansas GIS Office is pleased to share new guidance on the Arkansas Master Address Point database file structure. The guidance provides suggestion for adding two more attributes for local addressing authorities. These additional columns of information are specifically geared to lay the foundation for the address point data to serve public safety needs. Future implementations of Next Generation 9-1-1 systems will benefit from having these elements included. To learn more download the guidance document. The purpose of this guidance is to provide clarification that will enhance the Arkansas Address Point File with the addition of Landmark Name and Address Feature Type values. A Landmark Name record will allow entries for community and natural features that are well known and commonly referenced. These will allow public safety officials quick access to these locations. The Address Feature Type value is an organization of physical address records into a standardized set of categories such as commercial or residential. The GIS Office, in partnership with cities, counties and other stakeholders in Arkansas, coordinated the development of the Arkansas Address Point File project. This project built on GIS data from the Arkansas Road Centerline File. The Address Point File data was needed to compliment and improve the road centerline data and it also served the purpose of assisting the local 9-1-1 Public Safety Answering Points (PSAPs) with valuable data that can be used for emergency call dispatching. The Address Point File was built with adherence to a common guide. That guide was comprehensive in design and conforms to the Federal Geographic Data Committee Address standard. However, the initial construction of this data did not include certain content that is vital to public safety. authority entered values into the address feature type column, the result was nonstandard data and a wide range of inconsistency. The agency is providing this additional guidance that will lead to standardized address feature types. This enhancement will improve the data and can be used to perform other analysis in the future.